Call Forward Always – forwards all incoming calls to the destination you choose. Call Forward Busy – forwards all incoming calls to another phone number when the system recognizes the line is busy. Call Forward No Answer – forwarding only occurs when you are away or not answering your phone. Note: In order to select a number to which you want to forward your calls, you first have to set this number up on the My Numbers tab. Please see the My Numbers User Guide for more information. The following topics will help you with common Call Forwarding related questions. How do I enable/disable the Call Forward Always feature for a User? How do I enable/disable the Call Forward Busy feature for a User? How do I enable/disable the Call Forward No Answer feature for a User? A. How do I enable/disable the Call Forwarding Always feature for a User? Login to the My Account Portal. Click the My Site tab and select the Site from the list on the left. The My Site dashboard appears displaying quick links. Click on the User to configure the feature for and select Edit. 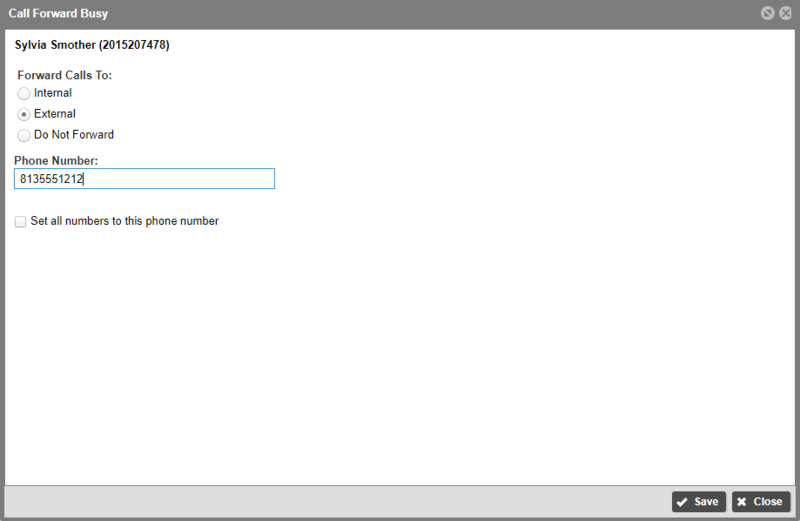 If Internal is selected, choose the phone to number from the drop-down menu. 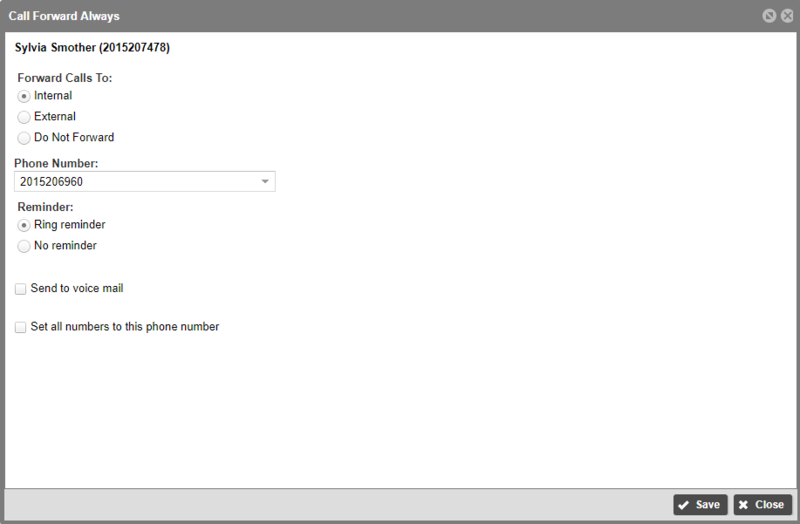 If selected, you have the option to choose to send calls to this number’s voicemail and/or set all Users numbers to this phone number, select the appropriate boxes, if desired. 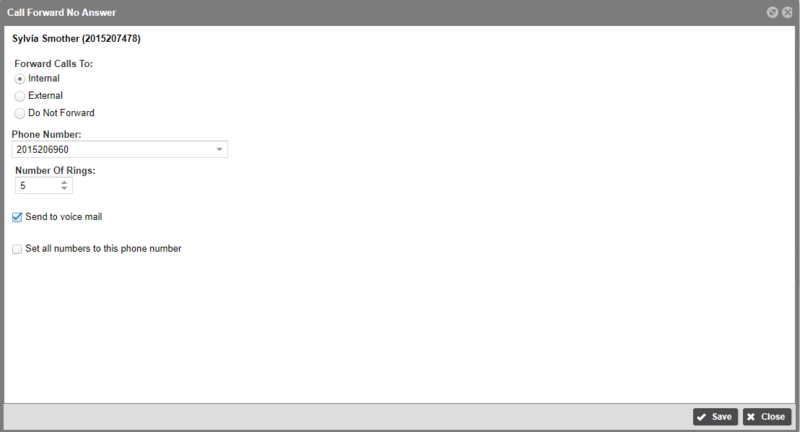 If External is selected, enter the number manually. You will also have to option to set all phone number to this phone number by clicking the check box next to Set all numbers to this phone number. To disable, check the Do Not Forward to disable call forwarding. B. How do I enable/disable the Forward Busy Calls feature? If Internal is selected, choose the phone to number from the drop-down menu. With this option, you choose the number of rings before the call is transferred. Choose the number using the arrows for Number of Rings box. You can also choose to send calls to this number’s voicemail and/or set all Users numbers to this phone number, select the appropriate boxes, if desired. If External is selected, enter the number manually. With this option, you choose the number of rings before the call is transferred. Choose the number using the arrows for Number of Rings box. You will also have to option to set all phone number to this phone number by clicking the check box next to Set all numbers to this phone number. C.	How do I enable/disable the Call Forward No Answer feature for a User? Click Call Forward No Answer.